One hundred and thirty years ago Peckham was a small and pretty village surrounded by cornfields and market gardens. So remote did it seem from the great city by the Thames that passengers to town were conveyed in a stagecoach. The enterprise and dispatch of which were testified by a notice board long preserved in the neighbourhood, and which bore the announcement, "TO LONDON AND BACK IN A DAY." Of this period Mr. G. T. Congreve, himself in later days a famous resident of Peckham wrote, "The guardians of the public peace were two or three old men with lanterns and staves, whose chief office consisted in looking up at the sky and listening to the church clock, and then waking up the peaceful inhabitants by bawling out the time in husky voice, and the information with it, that it was a fine or cloudy morning." There was at this time only one Dissenting chapel in the district this one being known as Hanover Chapel (Congregational), and enjoying great prosperity under the ministry of Dr. Collyer. Around whom flocked many persons of wealth and fashion, including members of the peerage and of the royal house. Among these was the Duke of Kent of that day, father of the Princess, afterwards Queen Victoria. But there was as yet, no Baptist Testimony in Peckham. It must have been about the time of the battle of Waterloo that a certain Mr. Spencer, who had been a prominent deacon of a Baptist Church in Blackfriars, removed for the sake of his health to the rustic village of Peckham. Finding no Baptist cause he opened his own house for prayer and fellowship. A tiny company of believers assembled week by week and the blessing of the Lord attended the meetings. His house faced Peckham Park in Hill Street, then a new street named after Rowland Hill's soldier nephew, a commander with Wellington. It soon became necessary to find larger accommodation than a private house afforded. Accordingly a barn, standing in Hill Street was fitted up for services. Growth once more necessitated a change, and the newly opened Lancastrian School in Hill Street was taken and a Church of seven baptised believers was formed here on December 15th, 1818. Next month six were added to its membership by baptism, the Church then as now, making immersion a condition of membership. Early in 1819 Mr. Thomas Powell was called to the pastorate, his ordination being celebrated in Hanover Chapel, then at the corner of Rye Lane and High Street i.e. opposite Jones and Higgins. The members of the newly formed Church realised the need of a permanent home and sought various directions for a site. Failure elsewhere seemed to force them to Rye Lane, and a chapel was erected at the corner of Blenheim Grove and Rye Lane where now Peckham Rye Station stands.There was strict evidence of the brotherly spirit prevailing between the little Strict Baptist Church and the large flourishing church of Dr. Collyer. For prior to building, care was taken to explain to the Doctor that it was from no spirit of rivalry that the chapel was to be built so near to Hanover Chapel. The new chapel was opened on September lst. 1819, and the first sermon was preached by Dr.Collyer. Mr.Powell carried on a faithful and useful ministry for nearly twenty years dying at length in harness in 1846. He was succeeded after an interval of two years, by Mr. George Moyle, at whose recognition services, held in May 1848, the questions to Church and Pastor then usual, were put by John Andrew Jones, great grandfather of Dr. Ewing. The gracious ministry of Mr.Moyle was one of steadily increasing success. While no remarkable developments arose the tender and loving spirit of the Pastor drew to him many earnest men and women, and prepared the way for the manifold activities of a later period.An examination of those early records reveals our forbears to have been men and women of intense prayer. This was a prominent feature of the Church's life and several evenings at the commencement of each new year were set aside for prayer. We are apt to think that, because those early Rye Laners knew nothing of the terrors of bombing they lived in days of unbroken tranquillity. The following Minute of the Church Meeting held on September 2nd 1849, disproves this: "It was agreed that four weekly meetings be devoted to solemn prayer and supplication to the Lord to implore Him to stay the prevailing and very alarming epidemic of cholera, and especially that the awful calamity may be sanctified to the church." A later Minute states "that special meetings for prayer were held in accordance with the above resolution and it is believed that our gracious Benefactor has condescended to hear and answer prayer, in the mitigation of His severe judgements on the inhabitants of the earth in a considerable degree." Our predecessors loved the truth; were not afraid to defend it and gave themselves to prayer on its behalf. On December 3rd, 1850, a special prayer meeting was held "to invoke Almighty God to appear on behalf of the Protestant cause endangered by the audacious aggression of the Pope of Rome in having recently appointed a Cardinal Archbishop, and the bishops assuming their name and title from various cities and large towns in England, and parcelling out various districts in order to establish a spiritual hierarchy in defiance of Her Majesty's prerogative, thereby endangering our protestant rights and liberties and the solidarity of the throne itself." 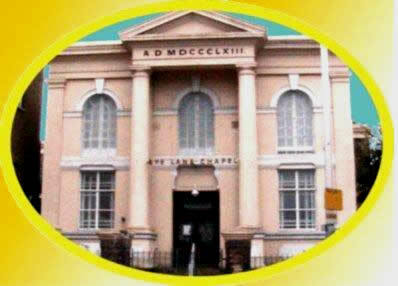 If the faith of the founders of Rye Lane Chapel was praiseworthy, their works were no less commendable. How they loved those who were in need! From the commencement, a Poor of the Church Fund was instituted and kept replenished. We find it difficult to appreciate all the institutions of a century ago, and pew rents is no exception especially when we discover that the amounts received therefrom were to be exclusively devoted to the minister's salary. Furthermore, we learn from the Minutes of 1850 that the only way the Church could increase their Pastor's stipend was to put in another row of pews! That being so, we imagine that the said shepherd would, in another way, be concerned about the size of his flock, on the principle of less persons per pew - less rental. A further innovation was the installation in 1861 of the first musical instrument - an harmonium to assist the congregation in singing. Another insight into the life at that time is the announcement that "the Pastor intended to give a short address on the Lord's Day afternoon for the benefit of servants who are unable to attend the other services of the sanctuary." The train was superseding the stagecoach, and at length a Bill was passed through Parliament empowering the erection of a station at Peckham upon the very site of the chapel. The rustic village was becoming a metropolitan suburb. A Church Meeting was held on December 29th, 1862. The Minutes of that meeting state that(besides females) 16 male members of the Church were present and five male members absent. After reporting upon the negotiations with Sir Claude de Crespigny Bart.the Church was informed that this land in Rye Lane had been considered by the Pastor and deacons as peculiarly eligible for the erection of a new chapel when called by Providence to depart from hence. It was then resolved that the Church approves, as a site for a new chapel and chapel house, the piece of land 80 feet frontage on the east side of Rye Lane adjoining the south side of the house occupied by the late Mr. Samuel Leigh and further approves the purchase of the same for £550 out of the proceeds of the sale of the present chapel property. This realised £3,270 and the figures of the tenders submitted make interesting reading compared with present day high costs. The lowest estimate was accepted; as follows:-Chapel £1,734; Manse £580; School Hall £340. Building commenced in the month of May 1863, and here we have light thrown upon the reason why our buildings stood up so well to the bombing. The records declare "that on digging the foundations it was found necessary for the security of the future buildings to lay concrete below the whole of the walls to a depth of 3 feet and width of 5 feet involving an outlay of £70 for the chapel alone.The Building Committee went to the site and certified the necessity of same. the wish to retire from the office of Pew Opener after leaving the old place, feeling inadequate to undertake the duties of a new chapel." Mr. and Mrs. Hazden were appointed in her place, the amount of their remuneration being £20 for cleaning, pew-opening, and attention of the new chapel, vestry and Schoolrooms. The School Hall was ready first, and was opened on October 5th, 1863. The evening meeting was held in the unfinished chapel, seats being arranged and a platform fitted up for the occasion. The scribe of that period states "that the building was crowded and the meeting profitable and pleasant." A month later, on Wednesday, November 18th, 1863, the chapel was opened. Prayer Meetings were held at 7 a.m. and 10 a.m. and in the afternoon an excellent discourse was preached by Mr. Moyle on "This Day is Salvation Come to Thy House." The report concludes as follows: "The day was remarkably fine; the services profitable and the people happy; the presence of God in our midst. Here may the King of Glory dwell long as the building lasts." Each generation can testify to the glorious fact that God has abundantly answered that prayer of faith. It now falls to my lot to deal with part of the history of our Church from the year 1863, soon after the present Chapel was erected. In those days, Peckham was developing from a village in the country to an outer suburb of the Metropolis. During the ministry of the Rev. George Moyle, the members had appointed three brethren to the Office of Deacon and the record of numbers at the end of 1863 indicates a fellowship of 101 members. The members for the most part must have been of humble status but one, Mr. G. T. Congreve, a Deacon and Church Secretary was apparently well to do. He was the patentee of the marvellous elixir, which was believed to be a wonderful remedy for the treatment of consumption. He was Superintendent of the Sunday school and evidently held in much esteem. It is worthy of note that in 1872, the post of Chapel Keeper was non-existent, but in that year a new Pew Opener was engaged at a salary of £30 per annum, £24 being found by the Church and £6 by the Sunday School. The pew doors have long since disappeared and at a very much later date, pew rents were discontinued. So far as can be ascertained the pew rents were the only remuneration received by the Pastor. In the records of new Members, it is of interest to observe that every candidate was expected to appear before the Church and make a personal profession of faith in Christ and an assurance of salvation. Admission has been made easier now,but perhaps the standard of Church membership lacks something of the seriousness of the days of a bygone century. Human nature, with all its failings, it appears, was much the same in the seventies as today. We find a complaint raised at a Church meeting that member (Brother X) had been the means of sowing disaffection in various ways, and had recently grossly insulted an esteemed brother publicly, in the lobby of the chapel. The Deacons considered it the duty of the Church to protect its worthy and unoffending member from such conduct. Brother X replied in justification of himself, but the Pastor referred to certain offensive things Mr. X had said at his house. Brother X declared it to be untrue and withstood the Pastor face to face. After considerable debate, a resolution was passed expressing full confidence in the Deacons and recording its dissatisfaction with Brother X. The matter was not then pressed further, but we shall hear more of Mr. X in due course. Mr. Moyle was now an aged man, and he had been Minister of the Church for 29 years. His health had been failing and he had been compelled to make long absences from his pulpit. In August 1876, he tendered his resignation, which was with much reluctance accepted. He had been Pastor of a small Church and the record of members at the end of the year was 166. It is interesting to note that although numerically small and lacking wealthy adherents, the Church unanimously agreed to provide for their aged Minister a pension of £60 per annum for the remainder of his life. About this time, an entry appears in the Minute Book indicating an increasing breadth of outlook by the Fellowship. A resolution was submitted that the Church admit baptised believers of honourable character to sit down at the Lord's Table,and that such friends should not be refused this privilege simply on the ground of the ground of their "not belonging to a Church of the same order as our own;" Considerable discussion ensued and the pugnacious Brother X strongly opposed the motion, supported by several other vociferous members. The voting on the motion was by ballot and the proposal was eventually carried by 79 votes to 32. We read that much confusion arose in the meeting, during which Brother X and another member expressed their rights with great vehemence. But Church discipline was a reality in those days and, when the disorder had subsided, Brother Congreve rose and proposed that as a duty to the Church and a duty to all our peaceable members, the name of Brother X be withdrawn from the list of Church Members at Rye Lane. In his remarks, Brother Congreve intimated that this recalcitrant member was one of the promoters of a Scheme to establish a new cause at Peckham in opposition to ours. But the resolution was never passed; Brother X rose and expressed his determination no longer to continue a member. His name was removed from the Church Roll. From subsequent entries we may assume that a potent source of disorder had withdrawn from the Fellowship and that peace and concord reigned once more. The next item of importance was the call to the Pastorate of the Rev. J. T. Briscoe, in December 1876. The call was accepted and the ministry of the new Pastor was obviously the foundation of much blessing to the Church. Early in his Ministry, Mr. Briscoe enunciated his faith and the Gospel he intended to preach. This comprehensive creed as recorded in the Minutes is one to which our present Members could wholeheartedly assent.The Diaconate was shortly after this strengthened by adding three additional members (making seven in all), and there are abundant evidences in the records that Divine blessing was accompanying the Ministry of Mr.Briscoe. In May 1878, a special meeting of the male members was convened to deal with a proposal to enlarge the premises. At that time, the length of the chapel was 20 feet less than at present, and there was thus an open space between the rear of this building and the front of the school hall. It was proposed to add this space to the chapel,and to widen this new portion to the present dimension of the two T's and to carry the gallery over the new addition. The school hall roof was to be raised and a gallery erected; the primary room and the Young Women's Classroom above were to be extended and other improvements made. The scheme was duly approved at a cost of approximately £4,000 but subsequently, the widening of the hall and other additional work increased the cost to the sum of £5,766. A loan of £3,500 was obtained from the Baptist Union and the Fellowship raised the balance of £2,266 within two years. A remarkable achievement considering that the only means of raising the money was by collecting boxes and private donations. Other signs of blessing were apparent in the large additions made to the membership. Peckham, of course, was no longer a rural village. It was now an outer suburb of London. But allowing for a large influx in the local population, it must be borne in mind that this factor alone does not ensure full churches. The ministry of the Pastor must, under God, in no small measure have contributed to such incidents as occurred in January, 1880, when 14 candidates were baptised on one Sunday and 39 received into membership. During that year, 103 new members were admitted and the fellowship at the end of December had increased to 401. So far as can be ascertained, the first reference to Missionary Activity was in March, 1880, when it was agreed to take up special Sunday collections for Baptist Missions and a visiting Minister to preach special sermons on that occasion. It is hard to believe that 46 years after William Carey had finished his course in India 'nothing had been done for the Missionary cause here in Rye Lane." But if the start was late, the impetus for this Ministry in later years was to be such as few Churches have felt in this country.The tide had now begun to flow- a godly ministry, a Church with a membership whose spiritual resources were centred in prayer and faith in a living Lord. Whose eyes were being opened to the needs of the Christless millions beyond the seas was receiving the touch of God's gracious hand. It was indeed stepping forward with a faith and a loyalty to God from which it has never yet receded. I am now endeavouring to give you a bird's eye view of the life of our Church during the period 1909/1927 as reflected mainly by reference to the Church Secretary's reports of the monthly Church Meetings. In my very limited space of time, you will understand, I am sure, that a great deal has necessarily been omitted and even that which I am going to tell you is somewhat scrappy and disjointed, but shall we call it Rye Lane Chapel Scrap Book 1909/1927? Those far-off placid days! The new century was only nine years old! I had just celebrated my first birthday and according to my Pears Encyclopaedia, in the big world outside Rye Lane Chapel, old age pensions had just come into operation and in April, Mr. Lloyd George was to introduce his first Budget. The January 1909, issue of the Rye Lane magazine reveals the fact that the minister was Rev. J. W. Ewing, M.A. B.D., the Editor of the magazine was Mr. Henry N.Philcox and advertisements were to be addressed to Rev. Clarence Chambers. This worthy former member passed on in March 1925, after taking an active part in the life of our Church. One of my earliest Rye Lane Chapel recollections isof this dear old saint proceeding down Lyndhurst Grove on a tricycle! With his short white beard and broad-brimmed black hat he looked every inch a Divine. If my memory plays me false, will any older member please see me afterwards? The advertisements in the magazine are interesting. Who remembers Warren Turners the Sports Outfitters, at Camberwell Green? I vow and declare that 35 years ago if I had been shut in that shop all one night I would not have minded one little bit! Footballs were selling from 2/6d. each and roller skates were from 1/11d. There was an enormous stock of indoor games, the magazine readers were asked: Do you WynKah? Can you Jiggle-Joggle? You really ought to Skimmo. I can only hope that these intriguing games of skill did not keep any youngsters from their Band of Hope, which was in those days, held on Tuesday evenings at 6.45p.m. Josiah Messent of Queen's Road, Peckham, offered a raven black morning coat and vest for 42/- and superior cashmere trousers for 13 shillings. Mr. George Crutcher, the proprietor of the Hatcham Dairy Farms, also of Queen's Road, announced that there were upwards of 80 superior cows stalled on the premises, and that milk was delivered three times daily at 5 a.m., 9.30 a.m. and 1 p.m. but the milk could be delivered at any hour convenient to an intended customer. What service! So much for the magazine advertisements- the magazine itself seems to have had its first issue in January 1898. Now bearing in mind the fact that after all, this is the Deacons evening, I would like to devote the next few minutes to a brief survey of Deacons' elections from 1909. It would appear that in the old days, when a Brother was elected to the Diaconate of Rye Lane Chapel, it was for life. In the Original Roll Book it is recorded that not until 1823 were Deacons known as such in Rye Lane Chapel. Then two were elected, one of them was Thomas Hirom Kentish, the founder member, and the original No. 1 on the Church Roll. I think I am correct in saying that only when the ranks of the Deacons were seriously reduced, an election took place. Do not imagine, however, that quite suddenly the Church switched over from Life Deacons to triennial elections. Even in 1910 the Church Meeting decided that Deacons' elections were not to be held on a Sunday, and furthermore a proposal to make Deacons' elections triennial was defeated by 124 votes to 80. Thereupon nominations took place, and there were 26 forthcoming, and ultimately five Life Deacons elected. It is worthy of note that in October, 1911 the Church Meeting sent birthday congratulations to Mr. George Creasy, the Senior Deacon. He was 92! He passed on to his reward a month afterwards, having been a member since 1866 and a Deacon since 1872. In 1919, each Church member was allowed to nominate three members as Deacons and the seven members receiving the highest number of nominations were submitted for election at the next Church Meeting. years at the Annual Church Meeting. I now pass on to various items of interest gleaned from the records over the years. In March, 1911, and again in September 1914, the Church Meeting passed a Resolution asking the London County Council to do all in its power to close Sunday Picture Shows. In May 1913, £48 had been raised for painting the exterior of the Chapel. The Choir had agreed to be responsible for raising £32 for overhauling the organ, and of the £28 required for cleaning the ceiling £20 had been promised by two friends. Therefore £8 was still required. The minutes record,"The pastor then made an appeal and in a few minutes the meeting had contributed the amount in cash and promises, and the Doxology was sung. I would assure friends that the craftsmen who attended to the ceiling in 1913 are not responsible for its condition now, and furthermore the small white objects which descend now and again at quite unpredictable times are not really snow flakes. The matter is receiving attention. On December 1912, the Church Meeting records: Received by Transfer 3, by Baptism 15, Nominations 14: a total of 32 members. The Church Secretary added happily: "The Meeting proved one of the most joyous that had been held and was closed with the singing of " Blest be the Tie" and concluding with the Doxology. In January 1913, Mr. Monro, Sunday school Superintendent and Deacon passed away - a man greatly loved. Mr. James Whitby, the then Church Secretary, was appointed Superintendent of the School but after few months resigned from the Office of Church Secretary as he had been called to the post of Sunday School Superintendent and desired to concentrate upon that work. In September 1915, Dr. Ewing announced his intention of retiring from the Pastorate of Rye Lane Chapel, after a service of 20 years, to become secretary of the London Baptist Association and to take over the Spiritual Oversight of the Churches. A year later Rev. A. Douglas Brown of Balham was invited to the pastorate but declined, then on April 1917, at the Church Meeting a unanimous resolution was passed that the members of Rye Lane Chapel should invite the Rev. H. J. Horn to become the Pastor of the Church. The Deacons were cordially thanked for their services during the interim period. It is interesting to note that during the month of April 1919, our Sunday evening services were actually held in the Tower Cinema. The venture proved a success. In September 1919, the Church Meeting approved the adoption of individual cups in the Communion Service. The former Silver Goblets are still on the church premises. * July 5. Rev. F. M. Price. * July 12. Rev. H. G. Hackworthy. * July 19. Rev. T. M. Bamber. * July 26. Rev. E. Rusling. At the July Church Meeting Mr. H. N. Philcox, asked for names of Ministers for consideration by the Deacons and the following were suggested: Rev. T. M. Bamber, Rev Cole, Rev. J. Daniel, Rev. H. G. Doel, RC Fowler and Rev. E. Rusling. be asked to preach on another Sunday. The following being the passages from which Mr Bamber took his text when preaching for us on Sunday, July 19th, 1925. In the morning: Genesis 3, "The sinew that shrank," and speaking to the children-gave them that they do it without grumbling . . . and at the evening Service quotations from James 5: 19/20 "If any of you do err . . ."
incognito down to Frinton to mingle with the congregation at the Frinton Free church and gain impressions. Our dear friend Mr Watkins holds the distinction of being the only member of the original diaconate who called our Pastor and who is still with us in membership. One item of interest was that these brethren sat quite separately and during the evening sermon Mr.Evans took notes. Afterwards he found out that the lady sitting next to him all through the service was Mrs.Bamber! And so our two brethren,call them scriptural spies if you like, returned home from Frinton with favourable reports. At the special Church Meeting called for on November 16th 1925, the deacons placed before the church a unanimous recommendation that the members of Rye Lane Chapel hereby cordially invite Rev.T.M.Bamber to be the Pastor of the church. The church members thought the Deacons had made a wise decision and thus our Pastor became the sixth Pastor to shepherd the flock worshipping at Rye Lane, Peckham. Listen to the words of the then Church Secretary, Mr.Picken dealing with the Pastorate...;"the principles on which the Deacons had desired to act in dealing with this most important and solemn matter, having regard to the position which the church holds among the Christian Community, not only of London but of the World, and of the long history and of the future possibilities of service of our historic church..."
The year 1926 was the beginning of the future possibilities for the Pastor and people of Rye Lane Baptist Chapel.